GUILDERLAND – Edith Bender Gerhardt (September 14, 1922 to September 7, 2013), beloved mother and wife of 69 years to Rev. Arthur H. Gerhardt was called to her heavenly home. Edith was a remarkable woman of faith and a devoted servant of the Lord. In service to the Lord, working side by side with her beloved husband, she was a children’s choir director, Sunday school teacher, organist, and President of the Ladies Guild among many other church roles. Her proudest accomplishment was her family and the raising of six children. Edith enjoyed spending time with her family and often entertained them with poetry she had learned in her youth. 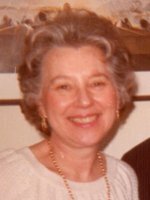 She was an avid reader of history, the family historian and photographer, an amateur bird watcher, enjoyed playing the piano, doing crossword puzzles, as well as sewing and quilting. Edith had a passion for gardening and tended her flowers and vegetable gardens well into her 80’s. She found great joy in raising her voice to praise the Lord with her fellow brothers and sisters in Christ as a member of the Jubilate Singers, as well as a member of various church choirs including the Delmar Senior Chorus. Besides her many community and church activities, she found time to serve on the Albany Medical Center (AMC) Ladies Auxiliary as a member and as President. She volunteered for various organizations including the American Red Cross and Cancer Foundation. Edith was the executive secretary to the president of AMC for twenty years. At the age of 62, she proudly graduated from Empire State College with her B.S. degree. She is survived by her husband, Arthur and predeceased by her eldest daughter, Grace Gerhardt. Surviving children include daughters Jocelin Hamblett, Lois Wilke Gerhardt, Dori Gerhardt and husband, Anthony Maione and her sons Stephen Gerhardt and wife, Marie and David Gerhardt and wife, Harumi. Edith was also blessed with nine grandchildren: Philip (wife Michele), Erich (wife Emily), Adam (wife Shawna), Anna, Graham, Gabriel, Nathaniel, Marigrace, and Isaiah and three great-grandchildren Benjamin, Kate and Cooper. Calling hours will be at Hans Funeral Home located at 1088 Western Ave, Albany, NY 12203 on Thursday, September 12, 2013 from 4 pm to 7 pm. A funeral service and celebration of life will be held at Christ Lutheran Church, 1500 Western Ave, Albany, NY 12203 on September 13, 2013 at 10 am. In lieu of flowers, donations in her name can be made to the Community Hospice of Albany County, 445 New Karner Road, Albany, NY 12205 or the Alzheimer Resource Center, Albany Medical Center, 47 New Scotland Ave, MC 65, Albany, NY 12208. To leave a message of condolence for the family, send a sympathy card, or obtain directions to the funeral home, please visit www.HansFuneralHome.com. I am very sorry for your loss. Mrs. Gerhardt was such a wonderful and loving person. Some of my fondest memories are being in the children’s choir at Christ Lutheran and the Christmas pagents because she made it fun. She always had the gift of making you feel so special. As I got older whenever we would have a conversation, I realized she made you feel like you were the only two in the room, even if there were many people. Someone that I admired for her personality, intellect , and abilities. She made my life easier for all the years we worked together. A remarkable and wonderful woman . My condolences to all of you. with the family. I am very sorry for your loss.. I went to School 27 in Albany with both Grace and Jocelin and went to bible school at their fathers church when it was near school 27 at the time. I remember you all very well and have fond memories of your family. I am sorry to hear the passing of both Grace and Edith. May God’s blessing be with you all during this time of loss. I still have the first grade class picture from school 27 with Grace’s picture in it.